Time to break some trademark rules in 2014? The US government’s announcement that it intends to transfer responsibility for Internet Assigned Numbers Authority functions to the internet community was one of the big talking points at ICANN 49, held in Singapore in March. 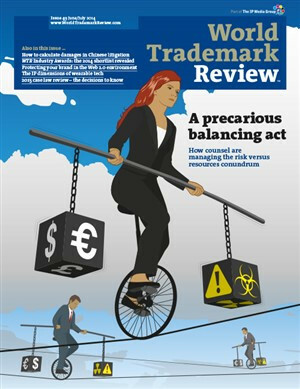 However, other issues of significance for trademark owners were also discussed – not least the Trademark Clearinghouse’s (TMCH) revelation that it had delivered over 500,000 claims notices as of March 25, with 95% of the queries for trademark terms that triggered claims notices not being followed through to a live registration. According to the TMCH, the fact that around 475,000 applications were dissuaded from progressing to registration was evidence that “the deterrent is working”. US Immigration and Customs Enforcement’s Homeland Security Investigations and US Customs and Border Protection have released their counterfeit and pirated goods seizure statistics for fiscal year (FY) 2013. Some of the key figures are represented below. Crowell & Moring LLP has announced the addition of partner Lora A Moffatt to the firm’s IP group at its New York office. In Backaldrin Österreich The Kornspitz Company GmbH v Pfahnl Backmittel GmbH (Case C-406/12) the European Court of Justice (ECJ) has ruled, on a reference for a preliminary ruling from the Austrian Supreme Patent and Trademark Court, that a trademark is liable to revocation in respect of a product for which it is registered if, in consequence of acts or inactivity of the rights holder, it has become the common name for that product from the point of view solely of end users of the product. A number of national offices have expressed their opposition to the European Commission proposal that ex officio examination of relative grounds be abandoned. In Office for Harmonisation in the Internal Market v National Lottery Commission (Case C‑530/12 P), the ECJ has clarified the approach that the Office for Harmonisation in the Internal Market (OHIM) and the General Court should follow when applying national law, and highlighted the importance of seeking information of their own motion. In H-D USA LLC v Berrada (2014 FC 207) the Federal Court of Canada has held that Harley- Davidson may sell its Screamin’ Eagle clothing in association with its well-known HARLEYDAVIDSON mark, despite another party’s trademark registration for SCREAMING EAGLE for retail clothing stores. Advocate General Wathelet has issued his opinion in Karen Millen Fashions Ltd v Dunnes Stores (Case C‑345/13), stating that Article 6 of the EU Community Designs Regulation (6/2002) must be interpreted as meaning that, in order for a design to be considered to have individual character, the overall impression that the design gives to the informed user must be different from that given to such a user by one or more earlier designs taken individually and viewed as a whole, not by an amalgam of various features of earlier designs. What will the devolution of Scotland from the United Kingdom mean for IP rights?